Property wasn't fantastic, better than advertised. Excellent apartment in front of the beach. Marvelous view. The beach is great and Kalamaki is a good base to see other beaches like Komos and Matala. There are restaurants, a supermarket, a bakery and also a rental car agency near the property. The host is very friendly and received us with fruits and gifted us with a bottle of local olive oil and another of raki (a local spirit). And you can sleep with the sound of the waves. The hosts were very nice and helpful. We asked for a taxi number and they were only too happy to sort it out and even arrange the pick up for us. The studio was tastefully decorated, spotlessly clean, bed very comfortable and kitchen sufficiently supplied for a short stay. Washing machine was a good addition for longer stays. Location was excellent with beach across the road and a good supermarket / bakery just around the corner. I would definitely stay again but chose a 1st floor room for the views and privacy. Location right next to the beach, apartment seemed spotless and new. Perfect sunsets. Our hosts were very friendly, welcoming and helpful. The view was lovely. Too beautiful to be true: the apartment is really a luxury one, the welcome is warm, the owner is a sweetheart: present but not invasive, the house is beach front (open the door, walk 2 steps and you are on the shore). Couple of seconds to reach restaurants and bars. Totally satisfied with our holiday experience. Our apartment was spacious, well equipped, clean, fresh, cosy - all joyous, with stunning view of the sea. The beach (wide and long, very clean), markets and taverns (fabulous!) just at the doorstep (yet we were not bothered much - the village is very quiet). Our host Anna was super friendly and helpful. Surely, we will come back. The appatment is just beautiful! clean and modern and has a great view of the sea. Just one minute walk from the beach. 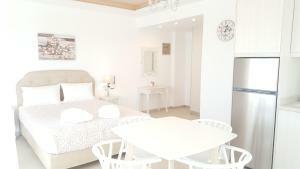 A great palce to relax and to explore the beautiful south of crete. The appratment was perfect and the hosts where very very very friendly. Highly reccomended. Lock in a great price for Bella Mare Luxury Apartments – rated 9.1 by recent guests! One of our best sellers in Kalamaki! 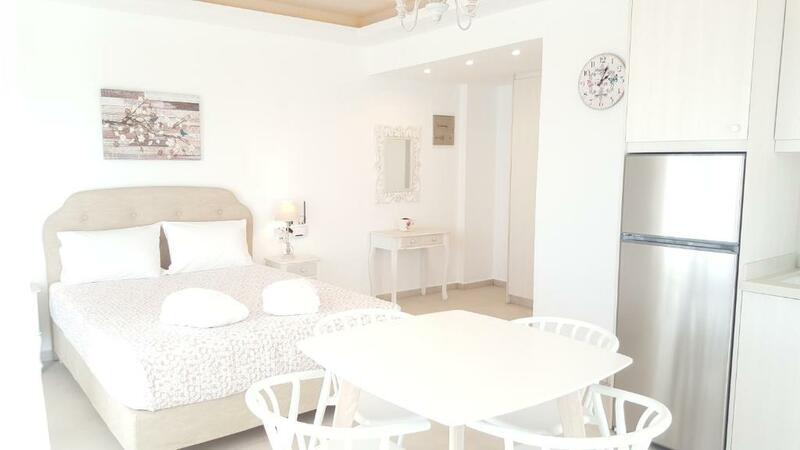 Located in Kalamaki, Bella Mare Luxury Apartments offers accommodations with free WiFi and flat-screen TV, as well as a terrace. 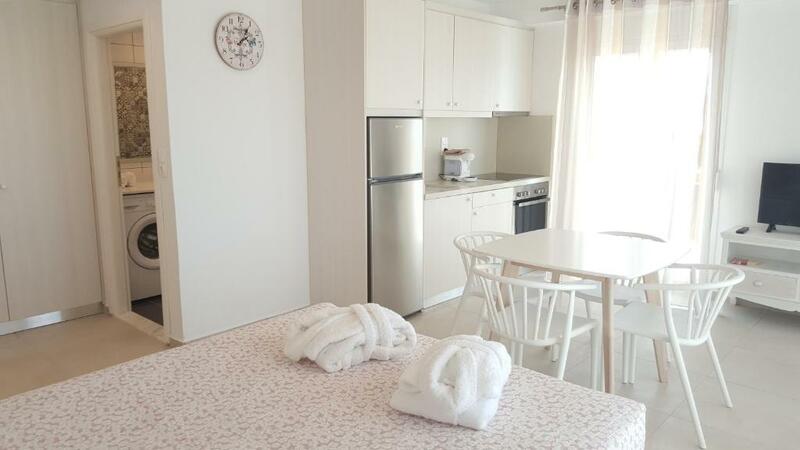 The units have a fully equipped kitchen with dining area, an oven and a fridge. 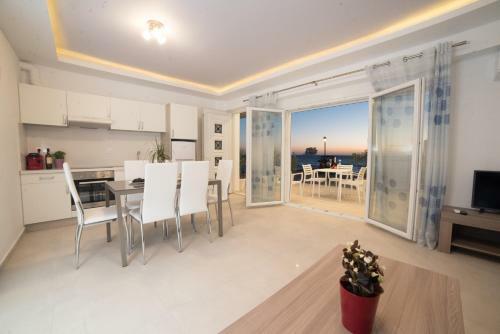 A balcony with sea views is offered in all units. Snorkeling can be enjoyed nearby. Agia Galini is 16 miles from the apartment, while Matala is 7 miles away. Nikos Kazantzakis Airport is 43 miles from the property. When would you like to stay at Bella Mare Luxury Apartments? This apartment features a seating area, patio and cable TV. This apartment features a washing machine, kitchenware and tile/marble floor. This apartment features air conditioning, private entrance and balcony. This apartment features a sofa and sea view. This apartment features a satellite TV, soundproofing and electric kettle. The newly built building Bella Mare Luxury Apartments is located in a very privileged position. 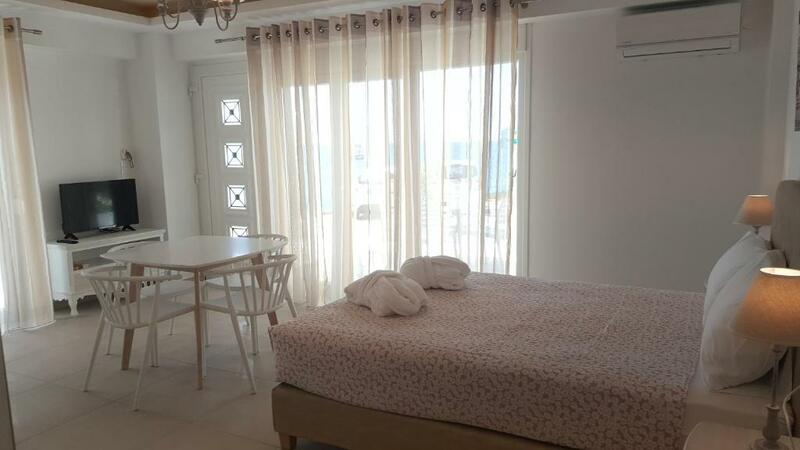 The distance of 10 meters from the beach, incredible views of the deep blue Libyan Sea and the complete equipment of flats, is ranked in first position of Kalamaki. The modern decor of all rooms will make you relax while the hospitality and comfort that will offer you will want to revisit us! We're Stelios and Anna. We have three daughters, Maria, Niki and Emma. Stelios and I we 're married 20 years ago. With love and respect each other we teach our children that a lot of work and passion can achieve any target put on their life. So we will wait for you in our apartments to prove to you our diligence and our hospitality !!! Kalamaki is a quiet village 60 km Southwest of Crete Heraklion, ideal for relaxing holidays. The streets of the village with taverns and shops will offer quiet walks while the excursion to nearby destinations such as Phaistos, with ancient finds and Matala nightlife she will be some of the options that you can do! House Rules Bella Mare Luxury Apartments takes special requests – add in the next step! Please note that check in and check out can take place throughout the day. Kindly get in touch with the property for arrangements. Please inform Bella Mare Luxury Apartments of your expected arrival time in advance. You can use the Special Requests box when booking, or contact the property directly using the contact details in your confirmation. nothing to fault. all was good. Studio's sitting out area which was on the ground floor was not private with people walking across even when we were having breakfast. Defining each studio / apartment private area with a low wall and building steps within the area to access the road would solve the problem. We were on the ground floor and our outside space was next to the car park which was a bit unfortunat with lots of cars coming and going meant we didn't wish to sit outside and eat. I think the upstairs rooms would have been better. Kitchen could be better equipped and suggest maybe simple welcome items provided, maybe water, shower gel, coffee and washing machine power. WIFI was really, really slow. I know, who needs internet if you are on holiday in Kalamaki? Could be a problem though if you are planning to do some work or Skype. 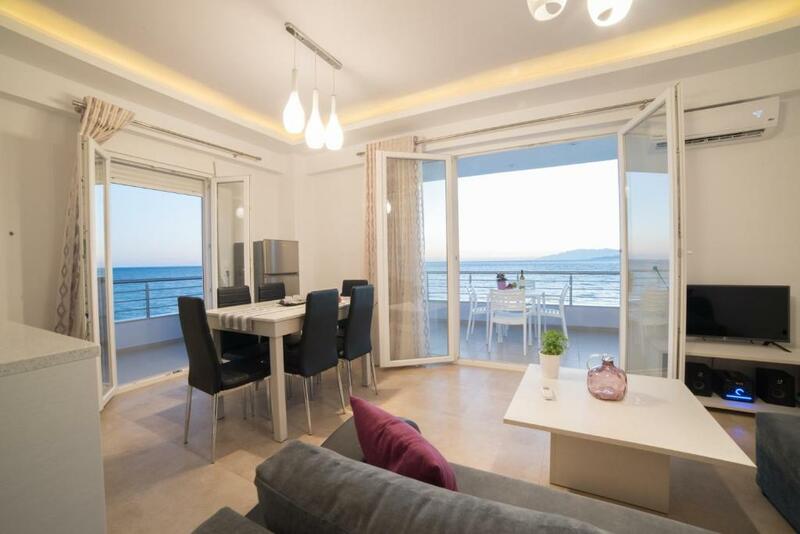 Fantastic views, right on the beach, very spacious apartment with 3 balconies(! ), hosts were fabulous, the place was spotless and cleaned thoroughly every day. Towels were provided, contrary to info provided on booking.com, and changed regularly. 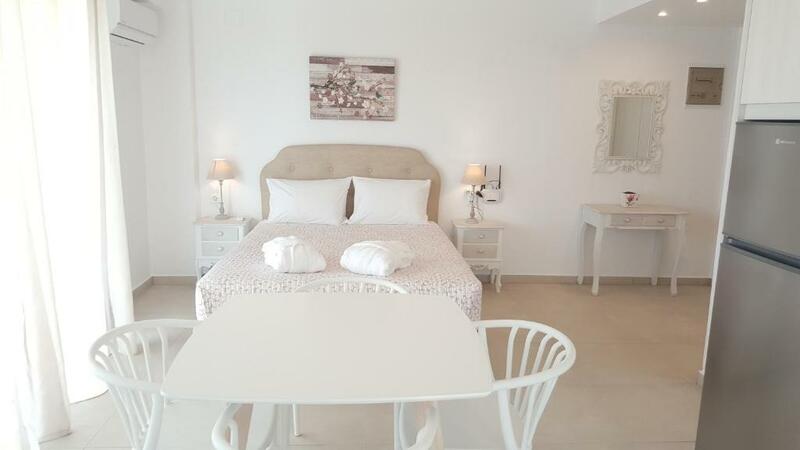 Kitchen well equipped, local shops and tavernas on doorstep. Brilliant bakery next door. A lovely, upmarket place to stay for a treat, in a low-key, laid-back village with lovely long beach. Booking.com info doesn't do it justice.